More commonly an excuse for high drama and dynamic design, the legend of St George inspired in Edward Burne-Jones a typically lyrical response. This image presents the viewer with something akin to a dream. The knight is hardy enough, dispatching his beastly (but undernourished) enemy with assurance; yet this St George is a creature of the mind. The blurry 'sfumato' of the forms - Burne-Jones had yet to perfect his brittle manner - and the elegance of the poses encourage reverie, not alarm. 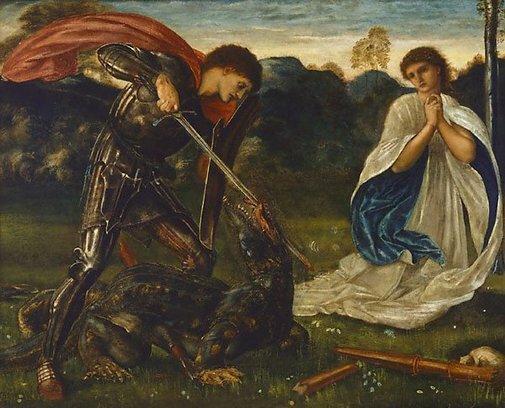 Burne-Jones was the least ideological of the Pre-Raphaelites, yet the most enduring, always keeping faith with a moonlit world of bloodless damsels and epicene saints. Henry James called the Burne-Jones type 'pale, sickly and wan'. No progressive, the English artist loathed the impressionists, preferring their symbolist contemporaries, whom he admired and greatly influenced. Signed and dated l.l., black oil "EB-J / 1864". Myles Birket Foster, 1864-1894, Surrey/England, Series commissioned in 1864 for the dining-room of Foster's house at 'The Hill' at Witley, Surrey. Series sold at Birket Foster's sale 1894 for 2,100 gns. C. Sidney Goldmann, 1898, England, In the collection of C. Sidney Goldmann by 1898, with some others of the series. Renée Free, Art Gallery of New South Wales handbook , 'European', pp 36-56, Sydney, 1988, p 44. Bruce James, Art Gallery of New South Wales handbook , 'Western Collection: Paintings and Sculpture', pp 17-77, Sydney, 1999, col illus p 38. Sir Edward Burne-Jones , London, 1993, col illus back page. Art Gallery of New South Wales catalogue of British paintings , Sydney, 1987, illus p 26, p 27. History and legend in some selected paintings at the Art Gallery of New South Wales , Sydney, 1980, illus p 14. Burne-Jones , New York, 1973, p 89. Art Gallery of New South Wales picturebook , Sydney, 1972, col illus p 27. Art Gallery of New South Wales Quarterly , Sydney, Oct 1962. Catalogue of Drawings , 'Memorials of E B-J', Birmingham, 1939, pp 296-7. Burne-Jones , 1904, pp 75-77. Burne-Jones , 1898, p 36. The Art Annual , London, 1890, p 26. Prints & drawings Europe 1500-1900 , Sydney, 2014, col illus p 149. Birket Foster , London, 1984, pp 97-99, p 176. Appendix no 8 including a photograph of the dining room at 'The Hill' with the painting in situ in another frame. Love and Death: art in the age of Queen Victoria , Adelaide, 2001-2002, p 158, col illus p 159.